This year I want to practice more random acts of kindness. Over the holidays, I went through the drive thru at Tim Horton’s and the person in front of me paid for my coffee. I’ve never had that happen to me before, but I found it an incredibly thoughtful gesture. I was having a bad day and it reminded me that there are still nice people out there in the world. I made these picture quotes of some of my favourite quotes about kindness. The advice they give is simple, but profound. Being kind does not mean being weak. I think it means the opposite. It’s so easy to judge others and I prefer to live my life focusing on the positive. 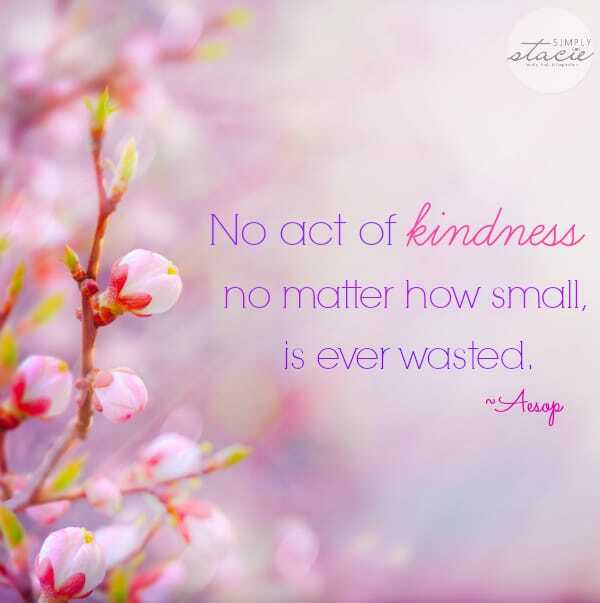 What are your favourite quotes about kindness? I plan on being kinder in 2014. I think it’s a goal we could all work towards achieving. These are special and should be shared! Thanks! I think kindness is always the best road to take. Great idea ! We could all use this idea a little more ! This is a truly wonderful idea! So obvious, but forgotten. I am going to try to think of a good quote or idea every time I feel a negative one come up! A few times when have been on line in grocer and was short the person behind me gave the cashier the change I didn’t have, still nice people in the world!! 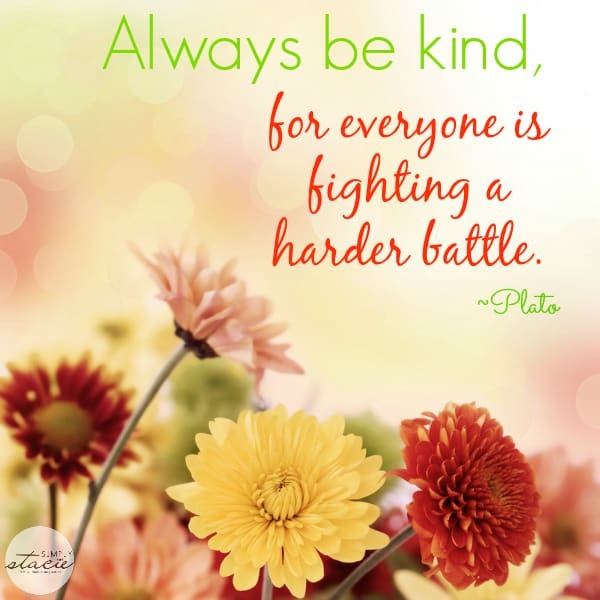 Plato’s quote about kindness has been my moto for years. For this, I love your blog. The quotes are my absolute favourite part. Thank you, I read them more often then anyone knows! These are such beautiful quotes. I’m going to print them out and stick them to my bathroom mirrors. All very true… I always try to live by life’s golden rule; I wish more people were self-aware and thought this way. Thanks for posting. 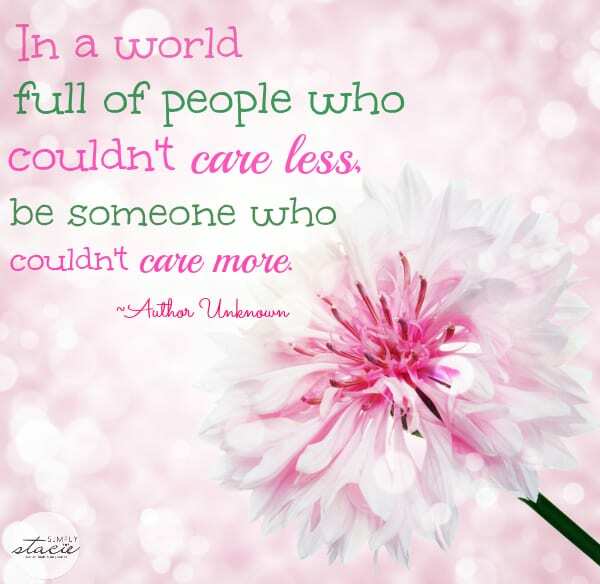 Wouldn’t the world be so wonderful if everyone just did one act of kindness. Last year I made it a point of doing a few acts of kindness to complete strangers and was rewarded with not only feeling better about myself but also gratitude. I always try to be kind to everyone. Wow that is sooo sweet. I had a kind experience before Christmas. I was 1 of 3 random people he gave $100 to. I was in shock. I always try to be randomly kind myself. It’s just so easy to do a random act of kindness… I still remember having my coffee paid for by the person in front of me at Tim Hortons. It felt amazing, and I floated on a happy cloud all day long. I knew then that I had to pay it forward, and just had to make someone else feel as good as I did! I’ve done it several times now – and I love it! These are such beautiful and uplifting quotes. So enjoyed you sharing them. I love these, saved a couple to remind myself! We all need to remember that kind words go along way in help others around us. I love these quotes and the pretty pictures. It costs nothing to be kind and may mean so much to someone who is feeling sad or unappreciated. I believe to paying it forward. love the idea of framing quotes, hanging them in common areas of the house. Or even have them in vinyl to stick on the walls…..beautiful. I love the Aesop one. We recently moved and our next door neighbor gave us a couple inflatables(an inner tube and boat) for our daughter. Also, Steve(front desk guy/security guard), always gives me his newspaper when he’s finished. These small gestures mean so much. 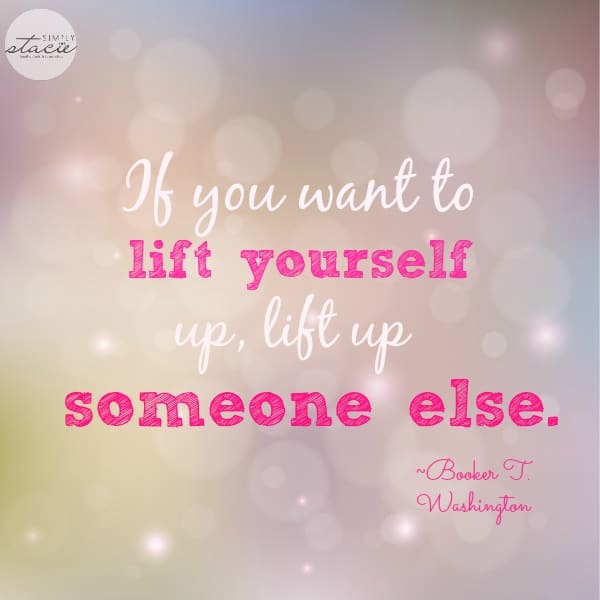 I love these quotes and I think it is a great idea to do a random act of kindness. I am going to try this more often. Today I let a woman who was complaining behind me go in front of me on the supermarket line. These quotes are nice makes you think it jst takes one person to act on it. Some lovely quotes, some I never heard of before-thanks! I especially like the last quote! It’s good to remember we all have fears, loves, and losses. I just love the quotes you have shown. I try to be nice to everyone. You have brought up a great subject especially with all the bullying going on. We need to help our kids do this. It seems like everyone is in such a hurry that they are always concerned with themselves. I could go on. I love this and thanks for sharing such great stuff on your blog!! I love this way of living. Just be nice to all. Treat others as you would like to be treated is the way to live and if everyone did this we sure would have a better world. Thanks for all the sayings and pictures. Great topic. Love the quotes, I think if more people tried to do things for others there would be less crime and hate. No matter what kind of day I am having I always say thank you, or hold the door open for others. Make a person smile and they will pass it on. I love this post! I am passionate about this topic! If you can’t do great things in life, do many small things with great love. We are all like angels with only one wing and can only fly while embracing one another. When you have the choice to be kind or be “right” … choose kindness. It is better to light a candle OR TO BE ONE, for yourself and others, than it is to curse the darkness. Treat others, including total strangers and those very different from you, not only the way you want to be treated but how you’d want the person/s/ you love more than life itself to be treated.. EVERYONE is someone’s someone special! The people who are the most difficult to love are often the ones who need it the most and to whom, when given genuinely can make the biggest difference. 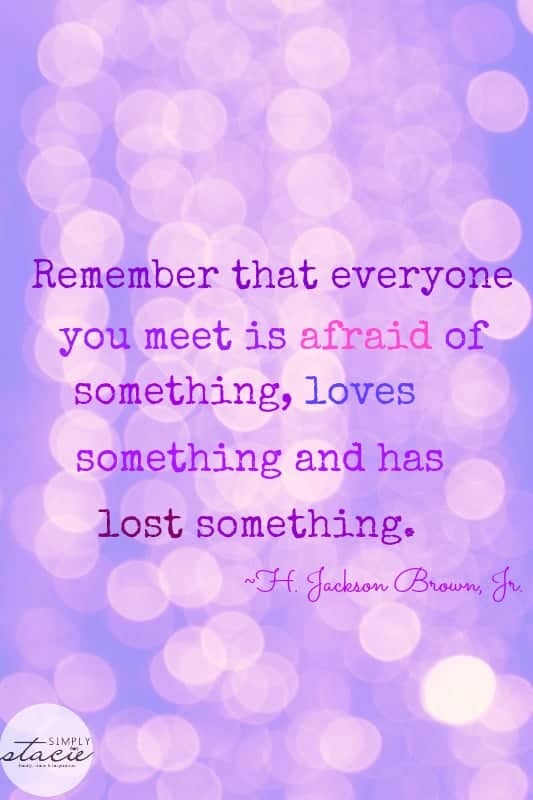 Love the quotes,I always try to be extra special to a stranger everyday ! These are all so wonderful — thank you for sharing! What beautiful quotes. Give thanks each day for all you have, then give of yourself.